This site is meant to show only some of the many gifts we can make available. We are continually finding interesting new products. We also specialize in customizing our offerings to match the occasion, interests and budget of each individual request. Welcome to Holly Barry House. We work with corporations, small businesses and the private sector in relationship development and maintenance, acknowledging people for the contributions they make to the lives of others. Personal greetings for life cycle occasions such as a birth, graduation, wedding, illness or bereavement, birthdays, anniversaries, and holidays. Business-to-business "Thank You" and "Congratulations"
Email or contact us with details of your budget, occasion and timing and we'll make gift suggestions to meet your important needs. Thoughtful gifts build great relationships. 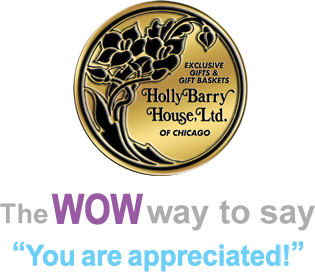 Click the buttons below to see and hear Holly's video and radio interviews and learn more about how gifts help to build relationships. My client in Los Angeles received the gift basket yesterday. He described it as first class, great presentation. Needless to say, it reflected on me very well.